A real case of same old same old here today. M was in fighting form before school, and sadly I mean the state of combat rather than raring to go. She is often like this in the mornings, until she gets to school and settles down, but today was particularly bad. I don;t know what more we can do, we have visuals and I never change the routine on a school morning, but sometimes autism doesn’t have a ready answer. I was amazed that we made it to school on time. Then I returned home to such chaos I didn’t know where to start so I abandoned all pretence of housework and made an important phone call. It was something I had promised to do to try and help someone, and I really wasn’t sure I could make a difference, but anyway, I did it, and followed it up with a lengthy email, so I am hoping to have done my part to make things better. I can’t really explain on here as it might get legal so just in case I’m keeping quiet. Due to a slight freezer door malfunction over the weekend the fridge was full of interesting items that could be heated up and mix’n’matched for tea so that saved me my normal running about like a headless chicken getting dinner cooked before I rush out to collect the little ones and take them to drama class. Eldest daughter was waiting at the theatre for us when we arrived – back from her music festival looking very tanned and very tired, so we chatted while the wee ones were occupied, then we trundled home through the rush hour traffic via a supermarket to pick up some essentials. We all ate leftovers and then I managed to get the wee ones into the bath for a lightning clean up before a quick cuddle and bed. The pair of them were totally hyper – I have no idea why – and I was close to losing my rag with them, but I held it together and we had lovely hugs. My children are so squishy and loving, cuddles are my very favourite bit of parenting. Oh, and just because I can, I am adding this part of a photo that shows my gorgeous girl having the time of her life at the RockNess music festival. This photo (I have cropped it) was taken by and is owned by the rather fabulous Newton Faulkner. 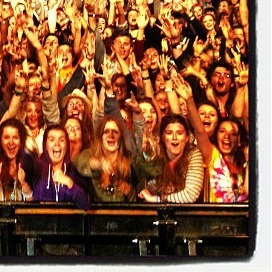 E is on the far right in the tie dye T-shirt – as you can tell she was enjoying Newton’s set a lot. Dd1 is off to a music festival tomorrow. With most of her school year and half the year below as well. They are camping on site. and she won’t be back home till Monday late afternoon/evening. 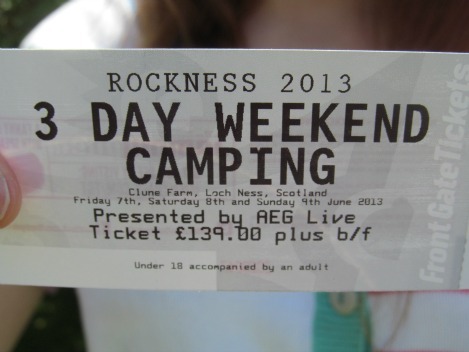 The line-up has her practically bouncing with delight and the weather forecast is good. It is the last chance all of her best friends will have together before they go their separate ways and I am praying it brings her joy and memories to look back on for a lifetime. I am trying so hard to be chilled about it. Last year a young man died at the festival after taking a “legal high”. Supposing she gets offered something, she will say no won’t she? There are always some idiots who get rip-roaring drunk and cause mayhem, and I don’t want her being in the way of any of them (she’s physically quite small). And as she is still just 17 herself I have extracted a promise from her that she won’t drink alcohol. I think I can trust her. She knows if she’s caught and ID’d she could be evicted and lose the weekend so I am hopeful. But, in any case, I need to learn to let go of her. She has now finished school forever (where did the time go?) and in the autumn she will be off to university in either Glasgow or Edinburgh so approximately 200 miles away – not round the corner, and my little girl will be an adult and all grown up. The first time she went away for a weekend with the scouts I remember feeling almost physically sick with worry. This was admittedly my problem, and nothing to do with the scouts or the leaders – just pure parental panic – and over the years she has become increasingly more independent, going away with school and scouts for ever longer periods of time. This is a Good Thing. If we are doing our job right as parents then our children should grow in confidence and learn to cope without us. This is how they learn to fly, metaphorically. I know in my head this is how it should be. So why does my heart hurt so damn much? A blog to myself really. On Wednesday I collected R, my ds1 from his boarding school for the Easter holidays. I travelled with my eldest dd, and the 2 youngest. After a lovely Easter service at the school we then headed down the road to Strathclyde University for dd1 to attend an open day. R was extremely uptight about this as I could not seem to find anyone at the university who was able to tell me of somewhere quiet that R would be able to wait while we schlepped about in dd1’s wake. We do live “in the sticks” so to him, Glasgow is the epitome of the big bad city, with all it’s attendant noise and smells, to say nothing of the sheer numbers of people. I had noticed a car park next to the hall we were starting at, and luckily we were able to park there. Little M went straight into her special needs buggy as a) she was highly anxious and b) I couldn’t risk her bolting. Poor R, aged 15, has no such safe place. He did accompany us into the hall, which luckily again wasn’t too crowded, but after 2 minutes he was starting to really twitch and I knew I had to do something. In desperation I asked him if he’d like to sit in the car. He jumped at the chance, and after making him promise he would lock himself in, I handed him the keys and he ran out the door. I kept texting him to make sure he was happy every time we moved somewhere else, and he assured me he was perfectly fine. He had snacks, a drink, and he was plenty warm enough. In the end we got back to the car 1 hour and 45 minutes after initially parking. R was totally immersed in a game on his Nintendo DS and was astounded we had been gone so long. He was safe, warm, quiet, in familiar surroundings and completely relaxed. But all I had felt was guilt I had “abandoned” him. We chatted a bit on the way back up the road and he was truly surprised that I had been feeling like that. His view was that if I had dragged him round with the rest of us then I should have a right to feel guilty as he would have been subject to numerous sensory problems and high anxiety. I had been “the best mum” for leaving him in the peace of the car. I was projecting my 15 year old self onto the situation, where I would have been extremely upset to have been left behind, thereby missing out on all the new and exciting discoveries. Of course, all the “new and exciting” to R is a form of torture, too many changes and would, without massive amounts of preparation, have been his worst nightmare. So although I consider myself quite the expert on my children, and no novice at the parenting of ASD children, I learned a valuable lesson. One I won’t forget in a hurry. As I have 5 children I guess it’s not surprising that I have busy days. But today seems to have been just that bit extra. Take eldest son to get his hair cut. This is a 10 mile drive along country lanes to the nearest town by the way. Run to the health centre to beg for an emergency prescription to be collected this afternoon (used my most winning smile to hopefully achieve this). Rush into the bank to set up a new payee and pay her. Get out the lunch money for next week’s school dinners while I’m there. Collect son and pay for haircut. Rush back to bank to take out some money to pay for eldest daughter’s Scout camp reunion tonight (thank goodness she remembered to text me in time.) Race home. Divide the washing between tumble dryer and the airers. Make lunch (thinking ahead of food intolerances of younger son) Nag daughter no 2 to put her guinea pigs in the run for some fresh air. Remind her half an hour later to bring them in again! Go back to town for another appointment with eldest son. And so it continued. Now it is just gone 7 pm and eldest is safely at camp (I do love mobile phones! ), the kids are fed, and hubby is home and chopping some veg for our evening meal. I still have to sling the youngest 2 in the bath, shove melatonin down M and get them read a story and to bed, all before 8 pm. I have left out about 30 other tasks that I have completed today as I didn’t want to bore you all with a list. And I wonder why I’m so often tired? I think I should probably wonder why I’m not more tired! I am betting that this will ring a bell with other parents. What it should also do is remind us that quite often we are flaming awesome – we pack so much into a routine day and then shrug it off as “just what we do.” Which is true, but it doesn’t make us any less amazing,. It’s Friday, give yourself a pat on the back for making it through another week.